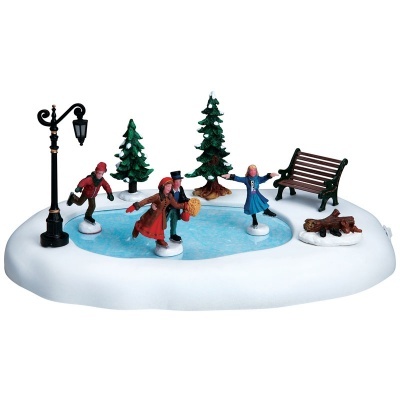 Lemax Winter Skating Table Accent depicts a joyful Victorian family enjoying a seasonal skate on the pond which has iced over in Winter time. A delightful battery operated miniature Lemax table piece to compliment your miniature Winter village display. The scene includes 3 Victorian figurines that realistically skate in sequence on the iced pond which exists on a snowed platform. Accessories including Christmas trees, park bench and a traditional Victorian lamp post are all fixed around the iced pond to add to the festive theme. Scaled and themed for placement in and amongst your Lemax Village scene to add movement in a Winter setting. Battery operated as standard, powered by an internal battery compartment underneath (AC mains adaptable). Winter Skating joined the Lemax Caddington Village collection in 2009.